Reduced prices on Weigh Safe Ball Mounts - save up to 15% OFF! - Ford F150 Forums - Ford F-Series Truck Community. Reduced prices on Weigh Safe Ball Mounts - save up to 15% OFF! Getting ready to tow and need to measure a trailer tongue weight? No need to go to the weight station or purchase a separate tongue weight scale. With Weigh Safe Ball Mounts measuring your tongue weight is quick and easy. It was awarded at the SEMA show as one of the best new tools and equipment by integrating a scale into an adjustable ball-mount drop hitch. This scale displays the amount of weight applied to your hitch. - SAE J684 certified and VESC Regulations V-5 compliant. Sounds interesting? Then make your towing easier now with Weigh Safe Ball Mounts. 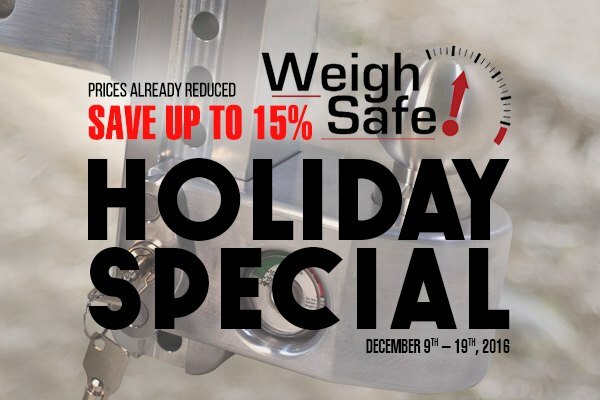 Buy any Weigh Safe products and GET up to 15% OFF. Do not hesitate and make your purchase right now. Prices are already reduced. Act now, this offer expires on December 19, 2016. PM me today for a quote or leave your inquiries below. Quick Reply: Reduced prices on Weigh Safe Ball Mounts - save up to 15% OFF!